Known as the ‘Supreme Nurturer’, Striped Jasper is grounding and stabilizing and provides comfort, security, strength and healing. 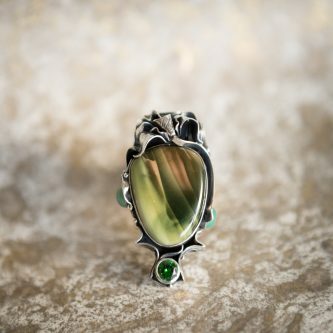 Worn by shamans, priests and kings, it was considered a sacred and powerful protection stone. Green Jasper reminds us of the spiritual connection we hold with all living things. It balances obsessive tendencies and restores harmony to the emotional body allowing one to gain control over thoughts. It is the ultimate sleep stone.